Groundbreaking new Elvis album features 14 original performances of gospel songs with newly-recorded instrumentation and backing vocals featuring legendary Presley alumnae including Darlene Love, Cissy Houston, The Imperials and The Stamps. "Since I was two years old", Elvis Presley once said, "all I knew was gospel music. It became such a part of my life, it was as natural as dancing. A way to escape my problems, and my way of release." It was gospel music that most ferociously stoked his musical passions, even as his unique synthesis of country, popular and rhythm and blues styles made him an idol to millions around the world. 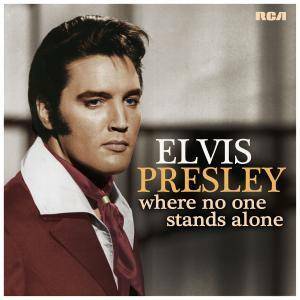 The new album Where No One Stands Alone celebrates the power and passion of Elvis Presley’s gospel music. Produced by Joel Weinshanker, Andy Childs and Lisa Marie Presley, the album features 14 of Elvis’ most treasured performances of inspirational music with rare alternate Elvis vocal takes and newly-recorded instrumentation and backing vocals, including members of The Blossoms, The Sweet Inspirations, The Imperials, and The Stamps Quartet. The title track, originally recorded in 1966, is presented as a duet between Elvis and his daughter, Lisa Marie Presley.